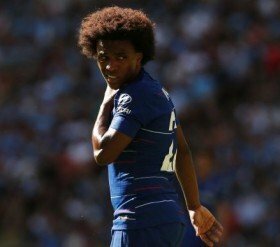 French giants Paris Saint-Germain could be in the running to sign Willian from Chelsea when the transfer window reopens at the end of the ongoing campaign. The 30-year-old was heavily linked with Les Parisiens during the winter transfer period as they sought a replacement for compatriot Neymar, who is on the sidelines with a foot problem. However, they could not find the breakthrough with the Blues but The Mirror suggests that this has not entirely ended their prospects of signing the experienced attacker. As per the publication, the winger has yet to extend his stay beyond the June 2020, given the Blues are reluctant to offer him more than a year's deal based on their shrewd policy concerning players aged above 30. Due to this, there remains the possibility of the Blues cashing in on his services in the summer and Les Parisiens are likely to put forward a package for the 30-year-old attacker. Willian has not enjoyed the best of campaigns with the west London giants and he has amassed just three goals and four assists in the Premier League this season.